In the late 1800’s, the Palmdale Water Company dug the first irrigation ditch to divert water from Littlerock Creek. The ditch was an amazing 6-1/2 miles, 6 feet deep, and 8 feet wide! It soon became apparent that water storage facilities were needed, and the South Antelope Valley Irrigation Company was formed in 1895 for the construction of Palmdale Dam forming Palmdale Lake. To bring water to Palmdale Lake, a wooden trestle and flume were constructed and an 8.6-mile earthen ditch, known as Palmdale Ditch, was dug parallel to the ditch dug by the Palmdale Water Company. By the early 1900’s the Palmdale Water Company and the Littlerock Creek Irrigation District had acquired the facilities of earlier water companies and began studying options and costs for Constructing one or more Dams on Littlerock Creek. They determined that a public irrigation district would be the best way to finance this construction, and the Palmdale Irrigation District was formed in 1918 by a vote of the public. The Palmdale Irrigation District was formed under the provisions of Division 11 of the Water Code of the State of California to supply irrigation water to the approximately 4,500 acres of agricultural land within its boundaries. Under this Code, the District’s primary functions were, and continue to be, to acquire, control, conserve, store, and distribute water for the beneficial use of inhabitants and water users within the District. The construction of Littlerock Dam & Reservoir was completed in 1924 with a water storage capacity of 4,200-acre feet and was noted as the highest reinforced concrete, multiple arch dam in the world! A great deal of controversy surrounded the design of Littlerock Dam, and by 1932, the State declared Littlerock Dam an unsafe structure and ordered renovations be made. Read more about the history of Littlerock Dam. By 1940, with sediment continuing to collect in Littlerock Reservoir, the State Division of Safety of Dam further reduced storage capacity in the Reservoir citing seismic safety concerns. Standby water wells were developed to help with water supplies. The local aerospace industry emerged at Air Force Plant 42 in the 1950’s, and the shift from supplying agricultural water to supplying domestic water began. To supplement groundwater and water from Littlerock Reservoir, the District entered into a contract in 1963 to take water from the State Water Project, or aqueduct, becoming a State Water Contractor. The capacity of Palmdale Lake was increased to handle the additional volume of water from the State Water Project and a water treatment facility was constructed. At the time, Palmdale Irrigation District’s boundaries were expanded to encompass about 34,000 acres. By 1966, the District was providing only municipal and industrial water. 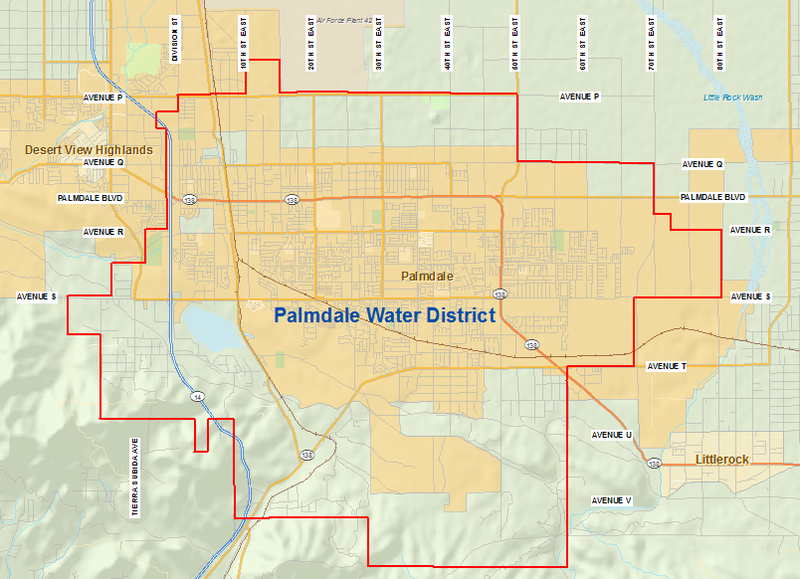 The name was changed to Palmdale Water District in 1973 to reflect this new direction. From 1965 through 1985, the controversy over the seismic safety of Littlerock Dam continued, and water demands increased tremendously. A 12 million-gallon per day water treatment plant was constructed in 1987, and by 1993 had to be expanded. It now runs at a flow capacity of 35 million gallons of water per day. A new office building was constructed and the old office building was leased to various businesses and organizations. Plans were finally under way to rehabilitate Littlerock Dam to provide seismic safety, increase water storage capacity, and renovate the recreation area. This rehabilitation was completed in 1995 and included raising the spillway height 12′ nearby doubling the capacity of the Reservoir. The historic wooden trestle and flume, which had been used and repaired over the years to transport water, were also replaced at this time with a 48″ diameter underground ductile iron pipe. The United States Forest Service maintains the recreation area at Littlerock Dam & Reservoir, and the District controls the level of the Reservoir and the operation of the Dam itself. The District’s boundaries now encompass approximately 187 square miles of land in northeastern Los Angeles County, consisting of more than 30 non-contiguous areas scattered throughout the Antelope Valley with the District’s primary service area within the City of Palmdale’s planning area. The distribution system has over 403 miles of pipeline ranging in size 4″ to 48″ in diameter, 24 active water wells, 14 booster pumping stations, and 20 water tanks with a total storage capacity of 50 million gallons of water. Because of increasing power costs to operate these facilities, along with the possibility of power outages, the District developed alternatives for providing our own electrical generation using wind and sun resources. A wind turbine generator was installed at Palmdale Lake to provide a large majority of the power needed to operate the water treatment plant, and a solar array system was installed at the District’s shop facilities to offset power costs. The District also works closely with electricity and natural gas providers to ensure energy efficiency and the best possible rates. The year 2009 marked the completion of another expansion to the water treatment plant to allow up 35 million gallons of water per day to be processed using state of the art disinfection methods. In addition, a plan to remove sediment from Littlerock Dam & Reservoir to increase its storage capacity is under way in addition to replacing water mains from the 1950’s through available grant funding. The old office building has also been renovated to provide additional office space for District staff. The District’s service area population is expected to more than double over the next 25 years which will cause water demands to more than double. A Strategic Water Resources Plan has been developed to address these demands and identifies a number of water resource options available to meet these needs including the use of imported water from the State Water Project, groundwater, local runoff, recycled water, conservation, and water banking and considers and evaluate these options with respect to cost, reliability, flexibility, implementability and sustainability. The Palmdale Water District Water Treatment Plant has been renamed and dedicated in honor of former longtime Director Leslie O. Carter. Read more about Leslie O. Carter and the Water Treatment Plant. To further ensure an adequate water supply, the Palmdale Water District helped form the Antelope Valley State Water Contractors Association. This Association consists of the Antelope Valley’s three State Water Contractors working towards the common goal of ensuring future water supplies and water storage areas in the Antelope Valley area.